Martha’s warm, mellifluous voice has been used for various purposes, particularly for corporate podcasts, training materials and internal newscasts. More than the voice, she researches and knows how to bring out the best in guest interviews using her journalism skills. She is available for either studio recordings or from her home studio system. Rates are non-union for finished dry voice, and package pricing is available for ongoing and repeat services. Martha also can lend her writing talents to develop and edit scripts through her marketing and communications services. To play: Hover over dark space before 00:00 on the left side. 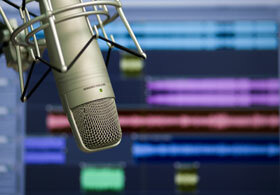 When a hand cursor appears, click to hear a sample of previous commercial work. To play: Hover over dark space before 00:00 on the left side. When a hand cursor appears, click to hear a sample narrative. To play: Hover over dark space before 00:00 on the left side. When a hand cursor appears, click to hear a sample of a podcast recording.